*And why we might be totally wrong. 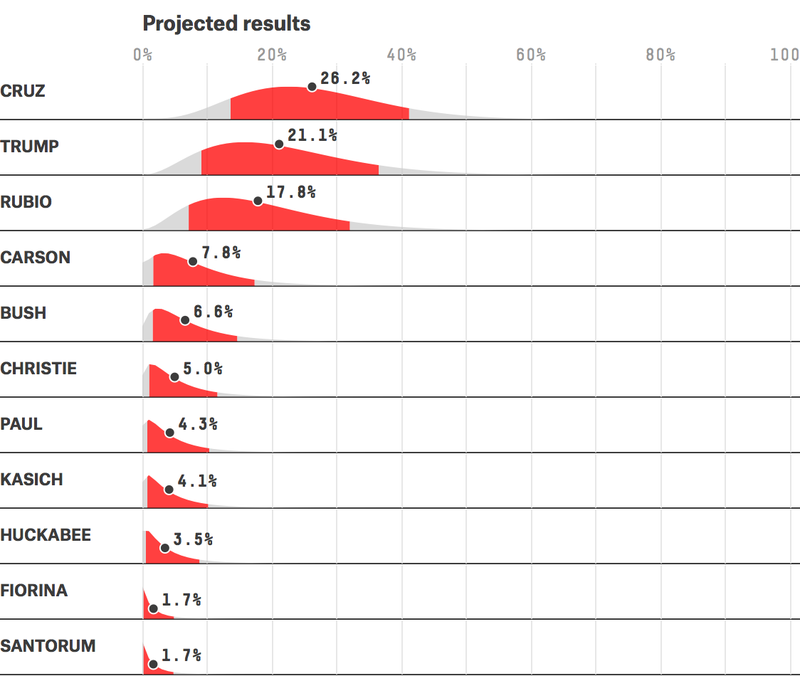 Forecasting primaries and caucuses is challenging, much more so than general elections. Polls shift rapidly and often prove to be fairly inaccurate, even on the eve of the election. Non-polling factors, particularly endorsements, can provide some additional guidance, but none of them is a magic bullet. And races with several viable candidates, like the one the Republicans are contesting this year, are especially hard to predict. But we do think our models do a reasonable job of laying odds and accounting for the uncertainty involved in the races. How safe is a 15-percentage-point lead in the polls with three weeks to go? How likely is a candidate in fourth place to jump to first? How should you weigh endorsements against polls? Our forecasts can answer questions like these. The polls-only model is based only on polls from a particular state;1 for example, only polls of New Hampshire are used in the New Hampshire forecast. The polls-plus model is based on state polls, national polls and endorsements. (National polls are used in a slightly unusual way; they’re a contrarian indicator. More about that later.) The polls-plus model also seeks to account for how the projected results in Iowa could affect the results in New Hampshire and how the results in those states could affect the results in subsequent contests. In theory, the polls-plus model should be more accurate than the polls-only model, but it’s a pretty small difference; in our backtesting, polls-plus was more accurate at predicting a candidate’s actual result 57 percent of the time, while polls-only was more accurate 43 percent of the time. That’s something, but there are plenty of times when the polls-only model will give the more accurate answer. Therefore, we think the models are more useful when looked at together. You’ll also notice that in some states — Nevada is one example — we list a weighted polling average for each candidate, but not a polls-only or polls-plus forecast. This is a compromise of sorts. The polls-only and polls-plus models are trained on past elections when there was quite a bit of polling data in the final 60 days of the campaign. So if polling data is sparse in a state this year, or if voting is still a long way away there, we won’t run a forecast. But we may list a polling average, which you can think of as a FiveThirtyEight version of the polling averages published at RealClearPolitics and Huffington Post Pollster. Maybe you’re the type of reader who’s interested in the fine print? What follows is a more detailed, step-by-step guide to how the models make their forecasts. We start by calculating a weighted polling average for each candidate in each state.2 The weights reflect the quality of each survey as determined by FiveThirtyEight’s pollster ratings, which grades polls based on their past accuracy and methodological standards. The poll weights also adjust for a poll’s sample size and how recently it was conducted. All polls are included in the weighted average unless they were internal polls released by a candidate or a candidate’s super PAC or if we have good reason to suspect that the poll faked its data or committed other gross ethical violations. The models do have a defense mechanism against potential outlier polls, however. Namely, polls are adjusted for house effects, which is a tendency for a pollster to consistently show different results for a candidate than the average of other polls.4 If a certain pollster consistently has Hillary Clinton polling 3 percentage points higher than other polls conducted in the same states at about the same times, for example, the model will subtract a fraction of that 3-point house effect from Clinton’s numbers whenever that pollster issues a new poll for her.5 The house effects adjustment is designed such that higher-quality polls (as rated by our pollster ratings) have more say in calibrating the polling averages. Thus, it partially corrects for low-quality polls that might “flood the zone” with frequent releases of questionable data. What’s the difference between the weighted polling average in a state, as described in Step 1, and the polls-only forecast? In fact, the differences are pretty minor. First, undecided voters are allocated to the candidates in the polls-only forecast. The allocation is a combination of proportional6 and equal. In designing the polls-plus forecast, we considered an array of possible predictors, including: endorsements, state and national fundraising totals, favorability ratings, ideology ratings and national polls. Just about all of these have some positive correlation with primary and caucus outcomes: Candidates with higher favorability ratings are more likely to see their ballot-test numbers go up than down, for example. And candidates who are good ideological “fits” for their states overperform their polls more often than not. In the end, however, we opted for a relatively simple three-variable model, rather than a “kitchen sink” approach. The variables are state polls, endorsements and national polls. The model also considers how the projected results in Iowa might affect New Hampshire and how the results in those states might affect subsequent states. I’ve already described the process by which state polls are used, so I’ll focus on the other factors now. As described in the book “The Party Decides,” party elites play an important role in the nomination process, and their endorsements are historically a leading indicator of success in the primaries. The media often puts a lot of emphasis on these endorsements during the early, “invisible primary” phase of the campaign but forgets about them once voting is underway. Our research suggests, however, that endorsements have historically remained a leading indicator of popular support throughout the nomination process.7 Even when party elites have failed to come to a consensus on a candidate before Iowa and New Hampshire — as seems to be the case on the Republican side this year — they’ve rallied behind a choice after the first few states voted, perhaps greasing the skids for his or her eventual victory. For instance, party leaders rallied behind John McCain in 2008, John Kerry in 2004 and Michael Dukakis in 1988 after their success in the early states, and nomination processes that once looked divisive turned out to be fairly smooth. We measure endorsements by endorsement points, which assign a candidate 10 points for each endorsement by a current governor from his or her party, 5 for each endorsement by a U.S. senator, and one for each endorsement by a member of the U.S. House of Representatives. More recent endorsements are weighted more heavily. So, for example, while Jeb Bush narrowly leads Marco Rubio in overall endorsement points among Republicans, Rubio gets more credit in the model because he’s received many more endorsements than Bush recently. As my colleague Harry Enten discovered, national polls have some predictive power in helping forecast the outcome in individual states — but not in the way you might expect. Instead, they have negative predictive power. For example, if you take two candidates polling at 15 percent in New Hampshire, the one polling at 10 percent in national polls is more likely to finish higher in the Granite State than the one polling at 20 percent in national polls. How to explain this? There are a few plausible explanations, but the most intuitive one is as follows. The gap between state and national polls is a good proxy for how well-suited the candidate is to a particular state. Maybe a candidate with strong evangelical roots is polling well in Iowa, for example, or a candidate who has spent months building a great ground game in New Hampshire is doing well there. Once these advantages begin to show up in the state polls, they tend to expand over time. Momentum of various kinds — a candidate who is beating expectations in a state will usually get favorable press coverage for it and may double-down on the resources he’s investing there — may contribute to the process. Also, note that as the election approaches in each state, the polls-only and polls-plus forecasts will tend to converge. The model is set up such that the weight given to endorsements is set to zero by Election Day in each state, while the weight given to national polls is reduced. Until Iowa votes, 20 percent of a candidate’s New Hampshire forecast is made up of his Iowa forecast. And until New Hampshire votes, 20 percent of his forecast in states subsequent to New Hampshire is made up of his New Hampshire forecast. Overall, this is a relatively conservative way to account for the results in Iowa and New Hampshire, which often prove to be extremely influential on the rest of the race. However, their influence can be hard to predict. Often, whether a candidate beats his polls is as important as his absolute finish in determining the media-driven momentum he gets out of these states. Will a candidate drop out? Candidates rarely drop out immediately before a major primary or caucus. If they’ve made it to within a couple of days of voting, they’ll usually play out the string, even if their position looks hopeless. The field usually winnows significantly after Iowa and New Hampshire. A candidate’s decision to drop out is influenced both by his absolute standing and his trajectory in the polls in upcoming primaries and caucuses. Candidates with negative momentum in the polls are at risk of dropping out, while those with favorable momentum rarely drop out. Why go through all this trouble to calculate a candidate’s dropout probability? It’s important from a technical standpoint because it can make a candidate’s range of possible outcomes irregularly shaped. A candidate polling at 20 percent in some state might ordinarily have a confidence interval that runs between 14 percent and 27 percent of the vote, for instance. But depending on other factors, there may be some chance he’ll drop out, in which case he could get close to zero percent of the vote instead. In our interactive, you’ll see a bunch of funky-looking curves like the ones below for each candidate; they represent the model’s estimate of the possible distribution of his vote share. The red part of the curve represents a candidate’s 80 percent confidence interval. If the model is calibrated correctly, then he should finish within this range 80 percent of the time, above it 10 percent of the time, and below it 10 percent of the time. The uncertainty is higher the further removed you are from Election Day. The uncertainty is higher in caucuses than in primaries. The uncertainty is higher earlier in the primary calendar than later on (perhaps because pollsters learn how to correct their mistakes from earlier in the process). The uncertainty is higher when there are more candidates in the race. Note that almost all these factors align to create a highly uncertain outcome in the first couple of Republican contests; there is an unprecedented number of candidates remaining, and endorsements, state polls and national polls are not in terribly strong alignment. You’ll also notice that the probability distributions are asymmetrical; typically, they have a longer right tail than left tail. (If you’re wondering, they’re calculated using a probit transformation.) In fact, this is a mathematical necessity for candidates with a small projected share of the vote. A candidate currently polling at 5 percent has some chance of gaining 10 points and finishing at 15 percent instead but no chance of losing 10 points and finishing with -5 percent. Accounting for a candidate’s probability of dropping out can add to the asymmetry. Given how we’ve calculated these ranges, we could theoretically just draw a random outcome from each candidate’s distribution and award the primary to whichever candidate finishes with the highest number. Except, it’s not quite that simple because every percent of the vote a candidate gains must come from some other candidate; if Bernie Sanders finishes toward the high end of his range, that means Clinton has probably finished toward the lower end of hers, for instance. The models use a fairly simple technique to estimate these effects and then run 10,000 simulations to estimate each candidate’s chances of winning. There’s also an awful lot our models don’t consider. For instance, they don’t do much to consider the interrelationships in the vote between different types of candidates. For example, if John Kasich gains a vote in New Hampshire, it’s probably more likely to come from a similar candidate like Bush than a dissimilar candidate like Ben Carson. Still, we hope they can form a reasonable benchmark for following the upcoming primaries, even if they’re almost certain to get a few races wrong. Well, that’s almost true. Technically, the house effects adjustment used in the polls-only model incorporates polls from all states, along with national polls. We also apply this process to national polls to calculate a national polling average for each candidate. Furthermore, in the model, the premium on recency increases the closer you get to the date of the primary. With 30 days to go, you shouldn’t necessarily sweat every tick in the polls — but with three days left, it becomes extremely important. We’ve previously included house effects adjustments in our general election forecasts, but they’re a new feature in the primary model, having not been included in our version four years ago. The exact magnitude of the adjustment depends on how many polls that pollster has conducted and how consistent the effect has been. A proportional allocation would mean that candidates get a share of the undecided vote that is equal to their share of the committed vote. Thus, a candidate polling at 20 percent would get twice as many undecided voters as one polling at 10 percent. If anything, in fact, their importance seems to increase the deeper the party is into its nomination process, as party leaders seek to achieve party unity and avoid a contested convention. Note that you shouldn’t attempt to apply this “trick” in states where there isn’t a lot of recent polling data. Other things held equal, if a candidate has gained or lost a bunch of ground in national polls, you should expect the same to be true in upcoming states. It’s only when you have enough state polling to prove that the gap is widening that this heuristic proves useful. If, for example, the model is expecting a 5-percentage-point bounce in New Hampshire for Ted Cruz because of his performance in Iowa but a number of New Hampshire polls show that he’s gotten no bounce at all, the model will quickly cease to give him credit for his Iowa performance. The polls-only model doesn’t use national polls or endorsements in predicting a candidate’s likelihood of dropping out. Instead, it looks at a candidate’s polling only in the state the forecast pertains to.